Probably my favorite type of builds in Lego are the dynamic builds, what are sometimes reffed to as kinetic sculptures. 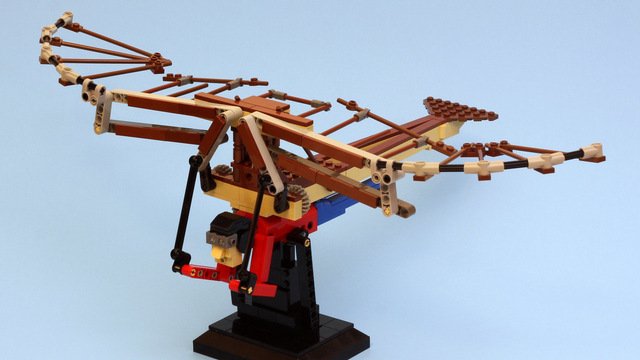 I was therefore absolutely thrilled when the Da Vinci Flying Machine showed up on Cuusoo and I was even happier to realize it is by one of my favorite Lego creators, Jason Allemann. Jason is one of our better well knows FOLs he certainly deserves it. His skill runs the entire gamete of themes from artistic to mechanical to even the programming side but most critically, a sense of humor. I'm from Ontario, Canada, I'm 41 years young, and I'm a computer software developer. Are you known on any other social media platforms? When did you first become interested in LEGO bricks? Did you have a "dark ages" and if so what brought you out of them? My history with LEGO bricks will probably sound familiar to other fans my age. I loved building with LEGO bricks as a child. I didn't have much - some basic brick, a couple of Classic Space sets and a few Technic ones. I really enjoyed building with the Technic sets. I was fascinated with building mechanical models, which clearly still continues today. My dark age was probably more of a 'gray age', as through high school, university and young adulthood I would still build on occasion. What really brought me back into the hobby was the release of the Star Wars sets in 1999. When I saw the original LEGO X-Wing (7140) I just had to have it. That of course sparked the slow but inevitable transition to a full blown AFOL. How have LEGO bricks influenced you? I think mostly they fostered my love of 'tinkering' as a child. There are so many skills that are developed by building with LEGO bricks - problem solving, visualization, creativity, coordination. I'm sure all of these things helped me become who I am today. Tough question to answer. There are so many amazing things being built these days by so many talented builders. I'm inspired by all of it. From the smallest micro scale detail to the largest complex creation. Having said that, I think the builders that inspire me the most are those that can capture some small detail perfectly with LEGO bricks. There are a long list of builders have done this. To single out only a few would be a disservice to the others. Although I will give a shout to Karf Oohlu I want whatever he's having. Inspiration comes from everywhere. Pop culture, childhood memories, discussions with friends, cool videos I see on YouTube, commercials on TV, a split second glimpse of something out of the corner of my eye. Sometimes I'll just Google 'cool mechanical creations' or something and see if anything interesting comes up. Most of the time it's just a quick reference to something that comes up in my day to day life. The next thing I know I'm planning some big project around it. Could you describe your Lego building methodology? Prototype, prototype, prototype. Especially for the mechanical models. It's mostly a process of constant refinement. Often I'll end up building 3 or 4 prototypes (sometimes even more). Each prototype progresses in either functionality or aesthetics until I've finally worked out all the kinks and achieved something I'm happy with. Then I'm ready to build the final model. I am a huge fan of dynamic Lego builds, builds that are able to move in interesting and often unexpected ways. Your Marble Labyrinth, Da Vinci Flying Machine, and Luu Ma are great examples of this branch of Lego designs. Do you have any advice for people looking to add motion to their builds? The best advice I have is to become familiar with what is possible using LEGO parts. You can easily gain this knowledge directly from the source - buy and build a few Technic sets. Most of the stuff I've built is peanuts compared to the complexity in some of the modern Technic sets. Pay attention to how the designers have accomplished certain things. My other piece of advice would be to never be afraid of trying something different. Sometimes it's better to toss out a design that 'sort of works' and start completely fresh. I can't tell you how often I've done that (because it happens all the time and I've lost count). The stand for the Da Vinci Flying Machine for example. Looking at it now it seems so simple, but I prototyped many other more complicated designs before it all came together the way it is now. Are there any reference guides that are particularly useful? Probably. I think there are some fan created websites and books that are good references for building with Technic parts. I don't used them. Google is your friend. When I need to build a certain linkage or solve a mechanical problem I'll see how others have done it in 'real life' and then try to translate that into LEGO parts. Do you have a favorite official Lego set? Theme? Figure? I'm not big into sets these days, except as a way to get new pieces. As a child my favourite set was probably the yellow fork lift (850). Man I loved that set. So simple looking back on it, but so awesome. When I came back into the hobby I was really into the Star Wars theme, but again, that's kind of waned. Overall I guess my favorite theme is Technic. I'm really not into minifigs. Are you a member of a LUG (or other Lego based community)? If so which one and what do you get out of being in a LUG? Yup, ParLUGment. It's always great to gather with like minded people in real life and discuss the hobby. Also, seeing models other people build in real life is so much better than seeing photos of them online. When I first posted my marble maze online a few people mentioned I should add it to CUUSOO. I figured sure, why not. Seemed like a pretty cool thing to try. I think CUUSOO is a great idea. I know people have various complaints about it, and I think there is room for improvement, but look at what it's already accomplished. Some pretty cool sets have been released that otherwise would never have been made. Mostly I just want to share my models with other people. If The LEGO Group eventually thinks it might be worthwhile to produce something I've helped design I think that would be pretty cool. Even if they don't, I'm excited that other people are excited by some of the things I build. The Space Shuttle crawler transporter blew my mind when it was posted: I'm a big fan of micro scale building and this thing is awesome. Octan in Space: I would love to see a modern take on classic space like this. Would you like to see any changes to the Cuusoo platform? From a technical standpoint I think it could use some refinement. It seems a little 'clunky' to me, not to mention pretty slow sometimes. It would also be nice if there were more useful community features. A better way to keep tabs on favourite projects and project creators for example.